Seems they have updated their website what do you think? Seems that in doing so all the users comments have disappeared. Considering the quality of the non-moderated and often personal attack comments that may not be such a bad thing . There is signal in those comments but often it drowned out by all the abusive noise, this specific forum is better for detailed discussion. I rather like it. It's much improved on mobile as well - site is now great to browse on a smartphone. 1. the two tiles to the right of the main featured article do not show the full headline text. Not good, should be fixed. 2. site is dog slow. It's just existing comments that have vanished. You can still comment so all the abuse will just continue. I hated the previous site. Like a poor copy of another most of us use, who then realised how bad it was and moved on themselves. Better. But there was nothing at all wrong with the original one. I am against changing them just for the sake of it, as sites usually start off quite well designed, then get chained to one not so good just to have a change. I like it. I'm not huge fan of responsive design as one site for all devices doesn't necesarry work well (see BBC homepage or F1.com on desktop as a example of bad responsive designs). There are still few bugs, but it looks actually quite good on both mobile and desktop device. I'm writing it after like 5 minutes of browsing, so I might change my mind later. So far I like it. Oh right, is this why it seems to take forever to load now... progress. There were too many bugs imo. Changed back to the new but the content is not up to date. Is it now called "Planet F1 & Rugby"? Because I'm seeing Rugby news, I don't give a chocolate fudge cake about Rugby and don't come to Planet F1 for Rugby. It looks quite nice - it's certainly fresher than the previous look. One big problem though - RSS feed has gone. I generally click through from RSS feed from both my desktop and smartphone. I like it, works well in mobile and looks very clean and simple. There does seem to be a minor issue with the titles of the two secondary articles directly under the headline article getting cut off... Unless the actual headlines are in fact "Bernie: No" and "Nico falling"
Looks like it got a virus and is very slow. The old site is much better. Very poor execution. You can see they tried to be fancy but just ended up cluttering everything - typical amateur mistake. I am no IT professional, but i did do a few filler courses in my degree, and this change goes against any best practice when it comes to design. Website is wayyyyy slower today. It's almost like it's playing chicken with the gateway time out filter and just when it's about to be booted comes back with a 'Nah, just messin with ya brah!' And loads all at once. On the bright side they seem to have fixed the issue of the titles not fitting in the space provided. It does seem like everything is seperate little tiles now though rather than one cohesive website. Overall I'm on the fence. The design has been rolled out across all their sites, F365 has changed as well. It looks better but the content isn't going to become better on the back of it. We are still ironing out a few teething issues, one of which is the speed of the site. The techies are working on it. If you have any issues please post them here and I'll bring them to the attention of the chaps that can fix them. Theres no text showing up for most of the articles in the 'More News' section underneath the main tiles. Running firefox on windows 10 if thats remotely helpful, can provide more browser details if needed. 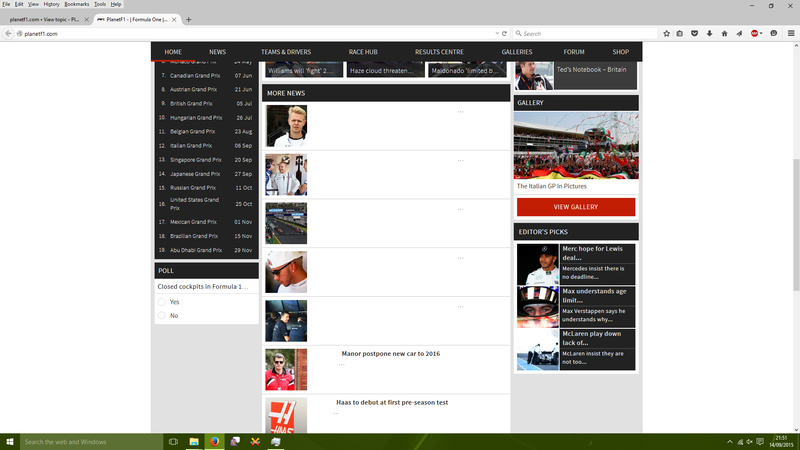 Does Planet-F1 still have a news page? My link doesn't work anymore. Try taking the dash out of the address, I think that's the problem. 2/ the difficulty; no, make that the impossibility to find the FULL GRID after qually or the FULL RESULTS after a race. Any answers fro the good and the learned guys here? This is how the mobile site looks for me and have done for the last months. It's different advertisements every time. But the cover half the freaking screen all the time. They stay glued to the top of the screen all the time and I can't click them away. If I go landscape mode it's even worse. It then covers 3/4 of the screen. I can understand you need add revenue. But this is insane!